Daddy-Os at the Lewiston parade of 2018 with special honorary Daddy-O, Gabby. (she is a patient at the Shrine Hospital and is doing great!) We are proud of our Gabby! The Osman Shriners Daddy-Os is a Rochester based Award Winning, Shriners motor unit made up of Shriners from the area. 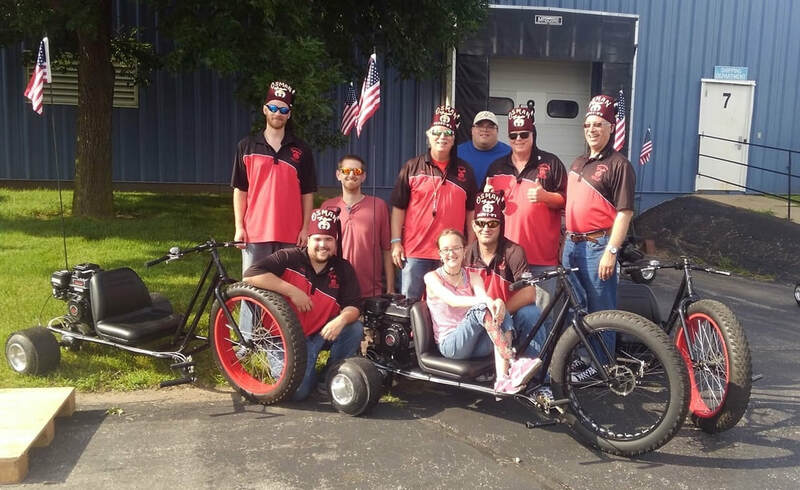 As the newest member of Osman units, they are excited to be involved in parades and show off their custom built drift trikes. The Daddy-Os drift back to childhood on their big-wheels in order to honor the children that they serve, and to remember that it is important to balance the seriousness of life with light-hearted fun. Led in the parade by their Skipper, the group does choreographed tricks and spins that are meant to be a nod to all of the neat-o-tricks and dreams they discovered as kids. It is their hope that they can remind other of those simpler days, and bring joy and dreams to those that need it. Shrine Hospitals for Children continues to change lives every day through innovative pediatric specialty care, world-class research and outstanding medical education. Today that philanthropic effort supports the health care system's 22 facilities across the U.S., Canada and Mexico, treating children up to 18 years of age who have orthopedic conditions, burns, spinal cord injuries, and cleft lip and palate. We have and will continue to ride with the goal of supporting this more than worthy cause..